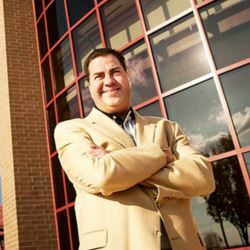 Karl R. LaPan is the first President & CEO of the Northeast Indiana Innovation Center. He has served in this capacity since the formation of the organization October 16, 2000. I enjoy my job because of the endless variety of things to do. All of our companies are different–which is the nature of innovation–with unique sets of entrepreneurial challenges and opportunities. For someone like me who loves entrepreneurship and believes in its benefits, helping them find new and creative ways to succeed is a very enjoyable way to spend my time. Simply put, I have never had two days that have ever been the same! My spare time is often spent with my family. Golf and tennis with my sons, family vacations in the surf and sun, visiting new places, sampling other cultures. Those are all my ideas of a good time. I’ve also made a lot of new friends in other non-profits and enjoy serving on other boards of directors. And, of course, my research and training travels on behalf of the National Business Incubation Association (NBIA) is enormously satisfying. Everything! I’m constantly amazed at how our city has grown and all of it located less than 20 minutes from my home. We have some significant community assets, too. I love the quality of the Embassy performances, and Science Central reminds me of my internal curious kid. With opportunities like these for our kids to be exposed to, the wonders of nature, science and technology, it’s no wonder we have such a talented pool of aspiring, young entrepreneurs. Kids today are starting their own businesses while they’re still in school! How great is that?